Have you resolved to improve your painting skills, but then it just HASN’T happened? Sitting down to paint has become a massive challenge? If so it’s highly likely you may have fallen victim to that enemy of self improvement – procrastination. And procrastination thrives where there are barriers in the way. So in this video I wanted to make the case that watercolours give you the best chance of ACTUALLY painting for a few key reasons. I hope this helps you start making the kind of progress you want to see! Do let me know in the comments below if the convenience of watercolours has been key to your making progress with your painting, or you think it could be. And also please share any other barrier reducing tips! I’ve painted in oils and acrylics and the cleanup can be monumental, the mess, odor, cleaning of brushes, throwing away dried up paint….hated that part of it. But watercolors…ahhhh….so relaxing. I can paint for a little while (although I tend to loose track of time when painting….I totally zone out), rinse out my brush and cleanup is done! Then when I go back to paint later, I pick up my brush, add a little water to my paints and pick up where I’ve left off. I love it!! Watercolor is my happy place….. I totally agree with you. I love watercolour for your same reasons. Great video – I will certainly share it with friends who have a ‘thing’ about watercolour! Yes! When I made the transition from acrylics to watercolors this year, I noticed all the benefits you mentioned which has motivated me to put more time into my art rather than procrastinate. I’m still learning, but feel more inspired than ever! Your course has been a real life saver to me, as a career who has very little time to myself and not being able to take time out to attend a course, I listened to your inspirational videos and you gave me the push I needed to actually put paint to paper, as well as the encouragement you also gave all the information on how and where to access all the equipment, I could have cried, hugged and kissed you. I have managed a few of the tutorials even though I may only get 1hour at any given time, a life saver, you are an amazing gifted and talented young woman ! I love it when you say, it may look like an ugly duckling, and encourage us to go on. Now relax and enjoy your new season, God Bless you and thank you so much. Anna, I am basically a watercolour painter from choice so far. Recently I have tried coloured pencils. These are less of a problem on all the four points you raised. 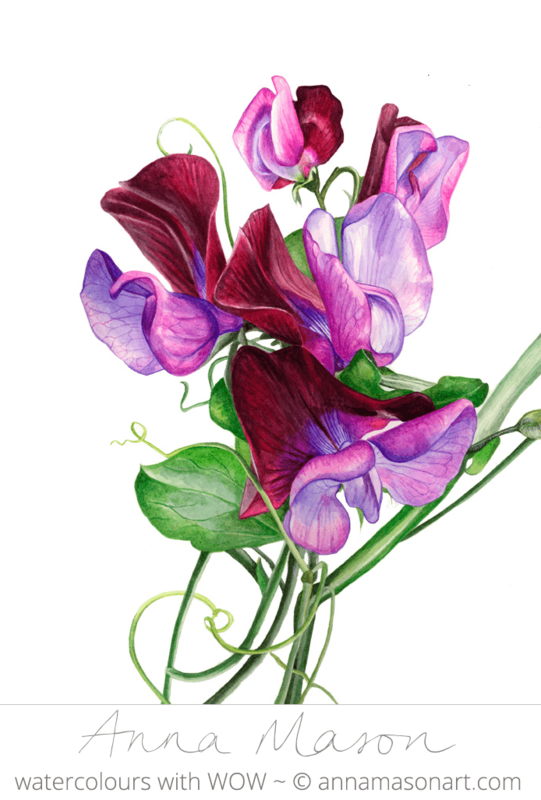 In recent years I have graduated primarily to botanical art. 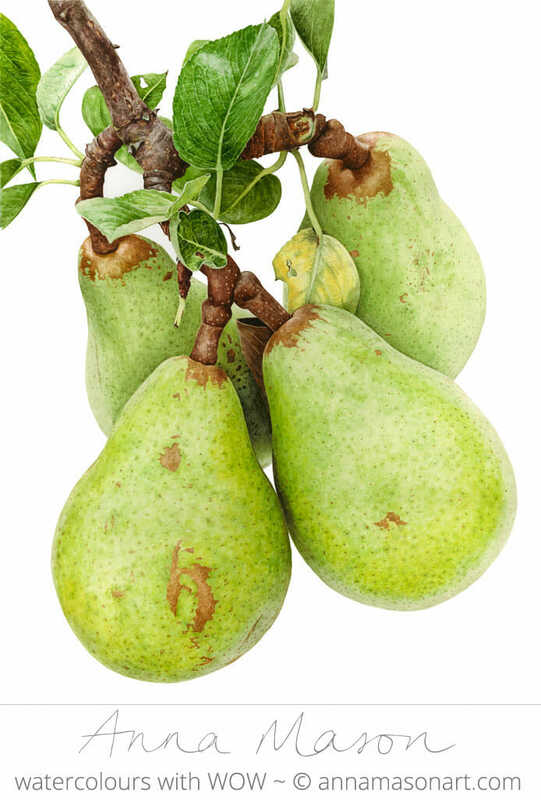 I am a committee member of South West Society of Botanical Artists and regularly exhibit in botanical exhibitions. My aim now is to submit for RHS medal status. Good luck to you and your husband on your forthcoming family event. I am a SAHM for my six children, I struggled to find time to paint for years. The pull to paint was too strong, so I started using watercolors and now I actually finish paintings. It still takes me weeks to complete a painting (I swear every other time I sit down to paint someone has a crisis within five minutes). I have a space dedicated to painting and everything is always set up, although sometimes my 2 yr old thinks he needs to help me paint and has ruined a couple of projects when I wasn’t looking. It all works out in the end. Watercolor is the only medium that is compatible with my life. How I understand you! Watercolor is a perfect relax for a very busy mum. But when I’m starting to paint I’m so involved in painting that I become ‘a beast’ when somebody stops me. My problem is setting up still life’s to paint. Then drawing. Ug. I recently (May) underwent a double masectomy and it really put a funk on my getting back into it…I keep wanting to join your site but dont have the brushes and even though I am a vet for medical I just cant swing the brushes right now. So painting AND paiting with you is on hold…I have hit a wall! Sorry to hear what you’ve been through Pam. Give it time. Sometimes the timing is just not right, but it will be! Hang in there. I have been through a similar thing Pam and my painting hit a wall too. It took quite a while but that creative feeling does come back. Once I gave myself permission not to feel pressured about it I began to slowly ease back in. It was nice to have some painting when so many other things about my self image were up in the air. Good luck. For those who are questioning the convenience of water colors, check out the facebook pages for The Nature Journal Club, Sketch Crawl and Urban Sketching. These groups all paint outdoors in a less formal setting than plein air. Even though these artists begin with sketches, many add watercolor to finish their piece. There are travel watercolor kits, or you can make your own set, or you carry watercolor pencils or sticks and learn the different ways to use them. In addition to being convenient, they are inexpensive. If you want to step up your watercolor paintings, then explore the glazes and mediums.. If you are not finding the time to paint, then join one of the groups in your area. Again, refer to The Nature Journal Club, Sketch Crawl and Urban Sketching. Most are free or inexpensive, and you meet like-minded people. Painting is an incredible hobby. There’s no end to learning, meeting people, exploring the details of your world, and it’s at your pace so it can be relaxing. Another way to become motivated is to take one of Anna’s classes. 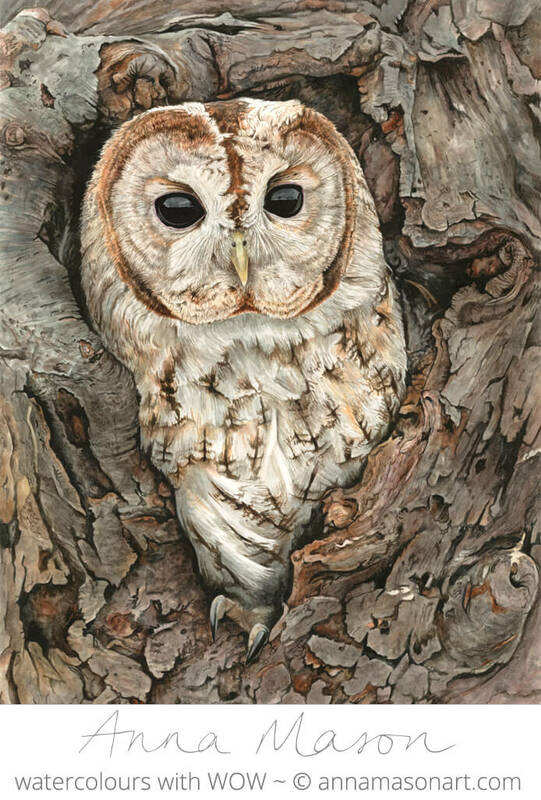 She will help you become comfortable with watercolors, and show you techniques that can be applied in other paintings. To keep your motivation going, join a relaxed watercolor group, and enjoy the world of watercolor painting. Me encantaría poder realizar este curso pero en idioma español. Podría ser posible??Gracias. So cute and I agree with your premise. I am still combining a little bit in my work but the picture of my Bird Girl #2 that I’ll be posting in my sketchbook soon and which is the preliminary effort for a much larger painting has the skin of the girl, my little step-great granddaughter done with oil after sealing the paper just in those areas with white acrylic. The rest is done in watercolor. (I did have to have 3 little cups with separate brushes for each medium though and my palette saver with the oil in it and a square of wax paper for the acrylic) More than just the ease of watercolor for sure! It’s amazing how much light can be achieved with the watercolor! It’s new to me but I am still adjusting to the same intensity of all the subjects in the composition. I will need to learn how to tone some areas down without taking away from the sunlight. It will come with time but for now, I’m allowing myself the freedom of learning and not being too critical. I don’t want anything to sap my joy! Thanks for the little video and I’m glad your doggy will have fresh air to breathe all round! So cute. Thanks for your inspiration and encouragement, Anna. So pleased watercolours are working for your lifestyle, thanks for sharing Ann! I haven’t had much time using WC to date. I did pencil and color pencil work before my accident. After my accident I have struggle to even know what to do. It isn’t a just practice, it will come back….it about 90% blank slate. So relearning. I have done a bit of CP since my accident, and a bit of water-color pencils. Even just the sharpening of the pencils though created issues for my cervical/neck issues. I loved the feel, just had difficult time. Its interesting to find that with the little WC pencil work that I have done is nearly identical to your process in WC painting. What I have found though with the couple projects from your school, straight up watercolor is so much easier on my physical limitations I still have; gives me the ability to take more time to actually be able to do some painting without having to stop from pain, or not be able to do for weeks because of pain. A year ago my situation was bleak concerning art…with the possibility of never being able to do any again. Thank the good Lord for healing, and for watercolor convenience and ease of use I am inching my way to recovery. And since it all seems so BIG at times, even the simplicity of the small plate palette make it all seem possible! Hurry to watercolors and plate Palettes!!! Although I meant Hurray to watercolors and plate Palettes…. I think Hurry to try watercolors would still be appropriate. Lol. thank you Anna for giving the public, and your students encouragements and reminders of importance of painting!!! Thank you for the video and I plan to try painting for 20 minutes each day. I just need to get my act together. I know that painting every day will help me get better. Thanks again!